Stars Leo Gorcey, Huntz Hall and Bobby Jordan. Which side of the law are the East Side Kids on? They're wondering themselves as they find that they're suddenly in the quagmire of robbery by blackmail! Stars Buster Crabbe, Julie London, Barton MacLane, Fifi D'Orsay and Bryant Washburn. A female twist on the Tarzan theme with Julie London as the jungle woman. Her closest friend is a huge gorilla. CLICK IMAGE FOR DETAILS. Stars Buster Crabbe, Julie London. A jewel thief escaping justice crashes in a plane deep in the Congo. He brutally kills the pilot and takes his young daughter into the jungle. He is killed and his daughter is raised by apes! Restored Classics Series from The Film Detective. Stars Charlton Heston and Eleanor Parker. One man's fight against nature run amok! A 20 mile stretch of vicious ants are eating their way across the South American jungle where Heston has a plantation. It becomes one man's fight against a horrible death. It was also a classic radio drama. Stars Bonita Granville and Frankie Thomas. Nancy Drew enters a local newspaper contest for the best news story. She get involved in a murder with twists and turn that lead her straight to danger. Stars Arch Hall Jr., Michael Terr, Liz Renay anmd Arch Hall Sr. Arch Hall Jr. is a spy AND a rock and roll combo leader. Rusian spies infect rabbitts with a plague. CLICK IMAGE FOR DETAILS. Stars Fay Wray and Grant Withers. Fay Wray gets entangled in a treacherous spy ring. Her boyfriend is arrested and she's being investigated. Is she innocent or also an underworld conspirator? Fragments of something are discovered in Antarctica. They end up on a navy base. There, they become nocturnal blood craving monsters. Tod Slaughter (Britian's Bela Lugosi) is up to no good again. He excels at playing warped fruit cakes. In this one it's Slaughter as a warden of a prison....it's like letting an inmate run the place. CLICK IMAGE FOR DETAILS. Stars John Saxon and Robert Crewsdon. An alien poses as a businessman in need of models. But the models end up heading straight for his home -- one of Jupiter's moons. Alien abductions and hip 1960's intrigue. Star John Agar. Experiments on how animal life is affecting in space bring about bad business. A groilla-like monster and other things go on the rampage with John Agar as a perplexed sheriff. CLICK IMAGE FOR DETAILS. From stories based on H.P. Lovecraft to Rod Serling originals...Serling hosts this amazing horror series that was at times thought provoking like TWILIGHT ZONE, but more often terrifying. 98 stories with stars like Vincent Price, Elsa Lanchester, John Carradine and scores more! Loads of extras. 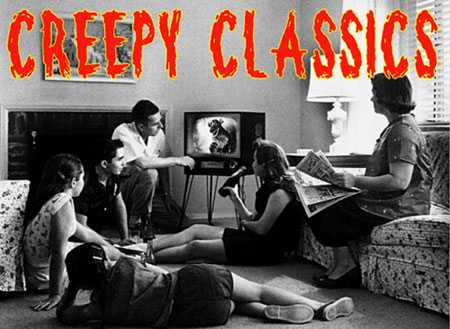 The classic TV horror anthology done with irony and twist endings! Twilight Zone with an edge from Rod Serling. The complete first season of episodes with lots of extras! INCLUDES the pilot movie with Roddy McDowell! Rod Serling takes a walk into the creepy side of The Twilight Zone with the complete second seaso of this TV horror anthology. CLICK IMAGE FOR DETAILS. Rod Serling's classic horror anthology show that followed THE TWILIGHT ZONE. Darker and twisted, these stories wrapped around Serling's ironic introduction in a gallery of macabre paintings. Stars include Vincent Price, Bill Bixby, Mickey Rooney and scores more. And lost tales of Season 2. Boris Karloff DVD Set: NIGHT KEY (1937), THE STRANGE DOOR (1951), THE BLACK CASTLE (1952), THE CLIMAX (1944), and TOWER OF LONDON (1939). CLICK IMAGE FOR DETAILS. Second Dark Shadows movie, based on the popular 1960's TV show. This one centers around a time warp and a ghost in a Tarrytown, New York mansion. TV horror magnate Dan Curtis was in charge of production. British musical fantasy. A well-to-do English gentleman opens an Egyptian sarcoghagus to find a live, flesh and blood princess. Together they go out on London Town singing show tunes. CLICK IMAGE FOR DETAILS. Film maker Joshua Kennedy was schooled in classic horror and science fiction. A tribute and tip-of-the-hat to his favorite Hammer film, THE GORGON. A young foreign college student begins to realize that she is the reincarnation of Medusa. Death and mystery all centered around NYC's Museum of Art. A gigolo marries wealthy women and kills them for their fortunes. Basil Rathbone is a madman that rivals screen crazies like Dwight Frye and Bramwell Fletcher (in THE MUMMY) for the most out of control hystronics. Rathbone is incredible in this! Stars Ed Nelson and Donna Bixby. An astronaut crash lands back on earth and pronounced dead on the scene. Suddenly he's alive and have a living alien within him, giving him animation. Horrorific 1950's sci-fi. A pair of goofy teenage girls survive a worldwide catastrophe where almost everyone is vaporized. If you were in a steel shielded room during the cosmic visit, you survived, if you were partially protected you become a zombie. A horror/sci-fi/comedy cult film from the 1980s. Robert Mitchum as a really a twisted psychopath killing scores of people as he travels the country. A little boy is on to him and the chase across the countryside is on. Not only horrifying, this film is beautifully directed, charming and poetic. Packed with extras...restored by Criterion. A few rabbits are injected with hormones that will stop reproduction in their genetics. Instead it makes them as big as bears and carnivorous. CLICK IMAGE FOR DETAILS. Classic story of radiation ringing the dead back to life...if that weren't bad enough, they think living people taste pretty good. George Romero directed. Classic story of radiation ringing the dead back to life...if that weren't bad enough, they think living people taste pretty good. George Romero directed. Colorized and Black and White versions. The full Criterion treatment for the 1968 classic NIGHT OF THE LIVING DEAD. Not only the very best restored print in HD, but an unbelievable amount of extras. Interviews, working print, dailies, promotional material, documentaries, interviews...click image for details. Double Feature: NIGHT OF THE LIVING DEAD (1968) and DEMENTIA 13 (1963). CLICK IMAGE FOR DETAILS. Double Feature: NIGHT OF THE LIVING DEAD (1968) and HOUSE ON HAUNTED HILL (1958). CLICK IMAGE FOR DETAILS. Stars Darren McGavin. This time it's a modern day Jack-The-Ripper...with a supernatural twist. It seems the killer has lived for over a century! Kolchak tracks the phantom to the underground old city below Seattle. 4K restoration. Commentary, behind-the-scenes featurette and more! A beatnik seaside carny town is where Dennis Hopper is spending some leave time from the service. He becomes mesmerized and infatuated with a mysterious woman who is the mermaid in a sideshow. CLICK IMAGE FOR DETAILS. Dennis Hopper becomes mesmerized and infatuated with a mysterious woman who is the mermaid in a sideshow. Dark, moody, avant garde atmosphere. This is the high quality DVD version of this film with extras. Bizarre cult film with a young Dennis Hopper. Hopper is spending some leave time from the service where he meets a sideshow mermaid. A moody world of the sideshow and Hopper's decent into otherworldly situations. A haunting dream sequence is a shocker! NIGHT WALKER (1965) William Castle chiller! Barbara Stanwyck has strange visions and waking dreams. DARK INTRUDER (1965) Stars Leslie Nielsen. A touch of H.P. Lovecraft as an ancient creature from another time is committing murders in San Francisco during the 1890s. Foggy and atmospheric. Stars Elizabeth Taylor. A widow who just returned from a mental breakdown. She's on the road recovery, at least that's what she and others think. Living in an old mansion, she glances through a window and sees someone being killed. The twists start and a high energy shocker ending! Stars Tyrone Power, Joan Blondell, Coleen Gray and Helen Walker. One of the most elusive and talked about "sideshow movies" ever. Right in their with FREAKS (1932) for its gritty (and horrific) depiction of carny life. CLICK IMAGE FOR DETAILS. A cheating wife of a demented evil scientist (not a person to cross!) has an affair. The husband kills his wife and her lover. To retain the estate, he marries his wife's half-wacky sister and tries to scare her to death. CLICK IMAGE FOR DETAILS. The husband kills his wife and her lover. The ghosts of the murder victims also join the party. Widescreen. Featurette with Barbara Steele. Extras: Barbara Steele conversation, featurette: Queen of Horror and more. CLICK IMAGE FOR DETAILS. A load of science fiction films...great for taking on trips (in this world, or any in the galaxy). CLICK IMAGE FOR TITLES AND DETAILS. Lighweight cardboard packaging. Two feature films: BLOODLUST (1959) and THE DEMON BARBER OF FLEET STREET (1936) starring Tod Slaughter. Plus, bonus cartoon: THE MAGIC MUMMY. Stars Greta Garbo, Ina Claire, Melvyn Douglas, and Bela Lugosi. A Russian woman falls in love with a capitolist and is torn between worlds. Sounds like a dull love story? It's not...it's a great 1930s comedy starring Garbo with a small, but great, role from Bela Lugosi. Two European thrillers. THE BLACK COBRA (1965) involves the death of a gangster and the mysterious revenge that grips a group of criminals. NO SURVIVORS PLEASE (1964) Extraterrestrial aliens take mind-control of leaders to bring about the end of humans, so the aliens can take over. Out-of-Print! Only a few left. Stars Anna Lee, John Loder. A wild, futuristic murder thriller aboard a non-stop air flight from London to New York. Anna Lee suspects a man is wrongly accused of murder and rushes to New York aboard this incredible air hotel-like plane. Cary Grant is thrust into a world of danger and death by merely being at the wrong place at the wrong time. An Alfred Hitchcock classic thriller. DVD includes a behind-the-scenes documentary, production stills and "music only" extra audio track. The first "Dracula" film was made in Germany with Max Schreck as the evil vampire. Accompanying the film is a 52-minute documentary which provides a detailed account of the production. CLICK IMAGE FOR DETAILS! NOSFERATU/THE LAST LAUGH/THE GOLEM - GERMAN SILENT MASTERWORKS (Triple Feature). CLICK IMAGE FOR DETAILS. The granddaddy of Draculas. Still atmospheric and eerie. Max Schreck as the gaunt, unworldly vampire king. A silent cob-webbed scream!